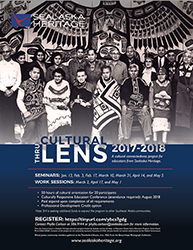 Sealaska Heritage Institute (SHI) is recruiting teachers and educators in Juneau for its 2018 cultural orientation program. The program, Thru the Cultural Lens, is a cultural-connectedness project for educators and pays a stipend to participants who complete all of the requirements. Participants also have the option to earn a professional development credit. The program will offer 50 hours of cultural orientation for 20 participants through seminars and work sessions from January-May 2018. Attendees also will be required to participate in SHI’s Culturally Responsive Education Conference in August. Educators may register at https://tinyurl.com/ybcs7gdg. For more information, contact Deputy Education Director Phyllis Carlson at phyllis.carlson@sealaska.com or 907.586.9144. This program is funded by Sealaska Heritage Institute and the U.S. Dept. of Education Alaska Native Education Program.